The 112-day leak at the Aliso Canyon facility released about 5 billion cubic feet of methane into the atmosphere, making it by far the biggest single emitter of the gas anywhere in the country, according to detailed assessment published in the peer-reviewed journal Science. From a climate perspective, the accident was historic: One leak producing a heat-trapping effect equivalent to the annual exhaust emissions from nearly 600,000 cars. “The climate impact is the largest on a record” for any single incident in the United States, said Stephen Conley, an atmospheric scientist at the University of California, Davis, and one of six scientists involved in the study. A 2004 accident in Texas involved a greater volume of methane initially, but much of the gas was burned off in a subsequent fire. The Aliso Canyon leak, which was halted only a week ago, illustrates how a single incident can sabotage efforts to reduce emissions of the gases blamed for climate change, the study said. California officials have called for dramatic reductions in carbon pollution for the state’s 39 million people, and offered tax rebates for consumers who buy electric vehicles. Yet the analysis shows that the methane flow from one damaged wellhead more than doubled the amount of methane pollution emitted by all sources across the entire Los Angeles basin. Without a doubt, the disaster has made it harder for the state to meet its carbon-reduction goals, the scientists said. 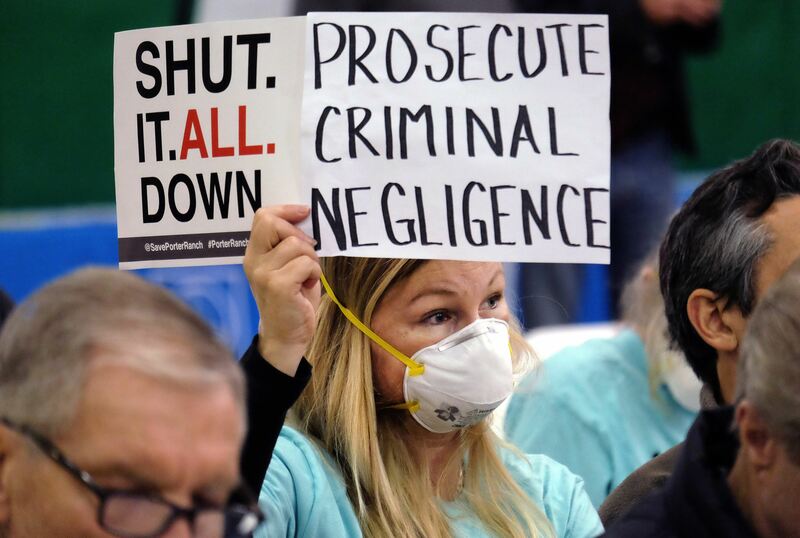 The leak, which was first reported Oct. 23, started with the blowout of a wellhead connected to a vast underground storage system for natural gas near the Porter Ranch community in northeastern Los Angeles. At the time, the facility, owned by the Southern California Gas Co., contained about 186 billion standard cubic feet of natural gas, making it the fourth-largest such complex in the United States. About 1,700 homes and two schools were evacuated because of the leak, as huge plumes of natural gas — captured by infrared video cameras — poured from the rupture for nearly four months. Officials for the gas company made seven unsuccessful attempts to stop the flow before the well was finally sealed with cement on Feb. 18. Conley, one of the scientists involved in collecting data about the leak from a private plane, said the amounts of methane discharged were so high that the researchers initially doubted their measurements. The gas from Alison Canyon in a single day was enough to fill a balloon the size of the Rose Bowl, the scientists said. The publication of the study comes as the U.S. Environmental Protection Agency prepares to tighten regulations on methane leaks from oil and gas operations. A draft study prepared by EPA scientists has suggested that the agency significantly underestimated the amount of methane being accidentally discharged from wells and storage facilities. Industry officials say they are moving independently to reduce methane leaks, for environmental as well as economic reasons. Methane is a powerful greenhouse gas, up to 25 times more potent, pound for pound, than carbon dioxide, according to EPA estimates. But methane also dissipates relatively quickly in the atmosphere — in decades, compared to centuries or longer for carbon dioxide. “As the science advances and data emerges, we need to make sure we’re addressing the biggest climate challenges, where the biggest opportunities can be found,” McCarthy told a Houston conference.